The quality of images used in Google Earth varies with year and with location, but currently the air photo used in our area is outstanding, provided the brightness and contrast are adjusted using Photoshop. According to the label, the area was "flown" on 10/8/2013. Although there is a 2013 air photo available for download from the National Agriculture Imagery Program (NAIP; flown 09/27 (check the Wisconsin Cartography Office for details), the quality is vastly poorer than the Google Earth image. I haven't used Google Earth for several years so I don't know when enhancements have been made, but the current version has a fascinating "history" slider. 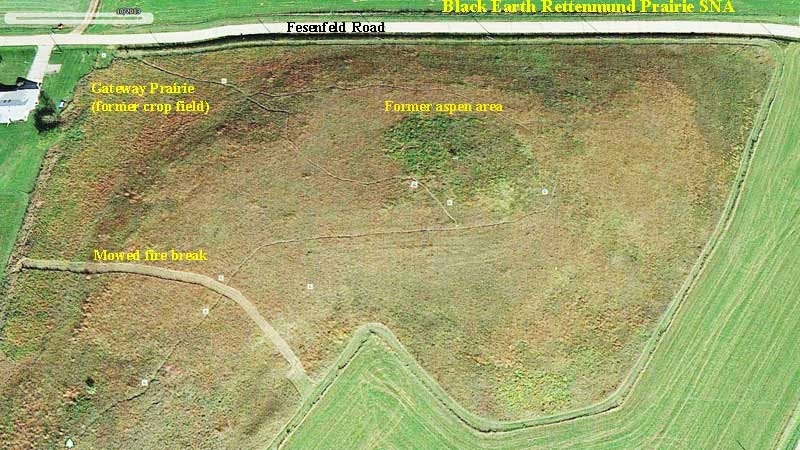 For the area I was interested in (Black Earth Rettenmund Prairie), 7 different images were available: 4/1992, 4/2000, 9/2005, 9/2006, 9/2008, 11, 2010, and 10/2013. By clicking the slider arrow, you can seamlessly move from one date to the next. Since Kathie and I started managing restoration at BE Rettenmund in 2000, the work we have done passed before my eyes as I clicked the slider. The best image is the newest (10/2013), which is shown here. As can be seen, the vegetation stands out clearly, and our trails and mowed fire break really show. Hopefully, a version of this image might be available that could be georeferenced in ArcGIS. Black Earth Rettenmund is a fine remnant prairie, but at the time the Nature Conservancy purchased it (1986) it had seriously deteriorated. About half the 16 acre prairie and been overcome with trees and brush, including two major aspen clones and lots of sumac, gray dogwood, and honeysuckle. Despite frequent fire (mostly biennial), we are still fighting the legacy of those days. Note the location of the former aspen clone in the photo. The green there now is not aspen, but prairie willow and hazel (both native, but still invasive). Other areas of the preserve have patches of gray dogwood. Sumac was once an even worse scourge, but after our four years of heavy work, it is no longer a problem. See this link from my blog for details on how we dealt with sumac. The Gateway Prairie shown here was a cropped area when TNC bought the site, and was ignored for 20 years. When Kathie and I started restoration it was a monoculture of Bromus inermis. Judicious treatment with glyphosate in early April, and lots of overseeding has turned the area into a fine planted prairie. Not as good as the remnant, but better than a field of smooth brome! Google Earth is also available as a mobile app for the iPad. Although the mobile version lacks some of the options available in the desktop version (the historical slider, for instance), the quality of the image is very high, especially with the screen on the new iPad Air. Last October (2013) the Pleasant Valley Conservancy crew led a field trip through our savannas and prairies for the Society of Ecological Restoration, which was holding a World Conference at Monona Terrace Convention Center. Since many of the participants were from overseas and hence not familiar with Midwest oak savannas, I prepared a photo brochure as a handout. I also wanted to have this brochure accessible through our web sites, but due to the high-resolution photos the file size was much too large. I have now found time to resize all the photos and prepare a new version suitable for download as a PDF (link below). This brochure is only 11 pages long, but the photos are pretty good, and each one has a fairly detailed caption. 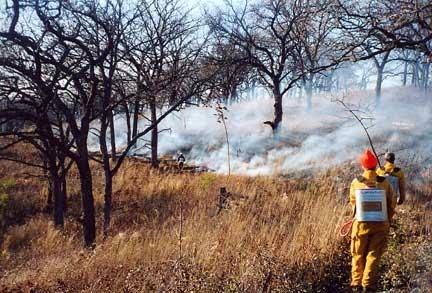 Oak savanna and oak woodlands burns are a lot different from prairie burns, as will be evident when looking at the brochure. We've been doing these burns for more than 15 years and have been able to profit from our mistakes. A lot more detail on savanna burns can be found at this link. This is the time of year when restorationists are cutting lots of brush. 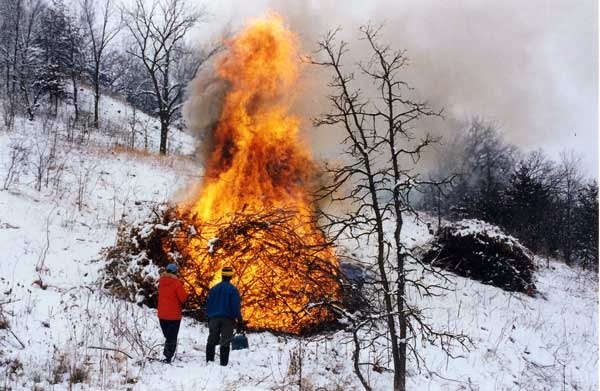 Often, the brush piles get fairly large, and when they are burned big sterile patches are created. How to revegetate these scars? Here is a suggestion that came to me from an experienced contractor. As soon as the fire is cold, use a powerful backpack leaf blower to remove all the ashes. The goal is to make the ground completely bare. Then hand plant each scar with a good prairie or savanna seed mix. Be sure to include several grasses as well as a dozen or so forb species. Use a high seeding rate (~50 seeds per square foot). However, even without planting, these scars should come back, since soil does not transfer heat well, and only the top cm or so of the burn scar will be sterile. The important thing is to get rid of the ashes. Incidentally, I can't recommend too strongly having a powerful leaf blower as part of your equipment. The recent Stihl professional models 500 or 550 are especially good because they start easily and really do the job. We have two and use them all the time for fire breaks, fire proofing around dead snags, and cleaning any area where we need bare ground in order to plant.